Sound familiar? Often we approach our relationship with God assuming that we have to act and speak a certain way for God to work in our lives. Yet throughout the Bible, we see God showing us that God is constantly present. We don’t need to summon God or say certain prayers to draw God near. 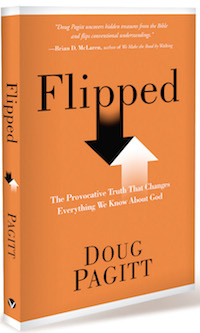 In his new book, Flipped: The Provocative Truth That Changes Everything We Know About God, author Doug Pagitt asks: How would your life change if you changed the way you understood God’s nearness? 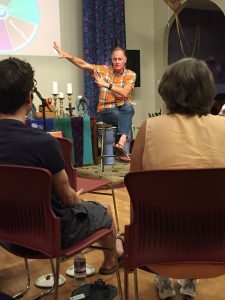 The more we’ve come to know Doug, the more we’ve come to admire his sense of humor, conviviality, casual leadership style, and deep love of God. We’re proud to call him a friend and to have had the chance to bring him to Maine. And the best part of it all is that Doug didn’t coming to Maine alone. Throughout this summer’s Flipped Book Tour, Doug is travelled with his good friend Heatherlyn, an amazing singer-songwriter. 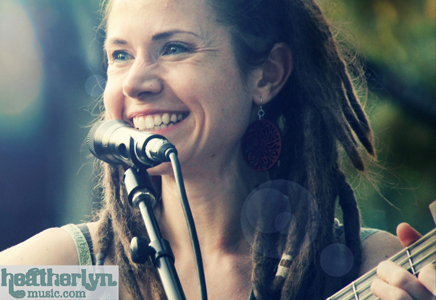 Originally from the East Coast of Maine, Heatherlyn has been honored twice as a Midwest Regional Finalist and awarded the Midwest “People’s Choice” of NPR’s Mountain Stage/NewSong Performance Contest. Together, Doug and Heatherlyn are quite a pair, treating audiences to excellent conversation along with thought-provoking, heartfelt music. 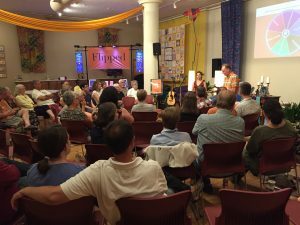 Interested in knowing what people like Rob Bell, Shane Claiborne, Brian McLaren, and Phyllis Tickle are saying about Flipped? Take a look at these endorsements.